The Suburban Style Life: Some decisions...finally! The west elm bi-colored grommet linen curtains in ivory/espresso! My plan is this, since I have so many windows all along the back of our house, I need coordinating panels, but not 6 of the same panels. It would be too much in my opinion. Most likely, the great room windows will either have these grommet panels in espresso from west elm in the same linen material. Even though the material of this panel is silk and the bi-color is linen, I think they would still go. I haven't officially decided on the linen or silk but we are making progress!!! 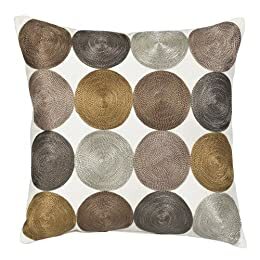 I also really like these pillows from Target. I have to thank my siser-in-law Amanda from sending me a picture text from Arkansas with her find. So cute so thank you!!!! They will definetly go with either of these panels. First things first, I am off to Bed Bath and Beyond tomorrow to buy the slider hardware. Woohoo!